Today is Sunday. I don't usually work on Sundays but it's also the 1st, which means payroll ended yesterday. Which also means I had to go into the frog to run payroll and do a few other things. In an attempt to be like our friend Jen, Greg (while I was working at the Frog) went to Vons to get a few things and to attempt to buy enough stuff to get free movie tickets. 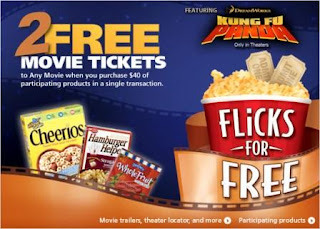 Currently, Safeway/Vons is running a deal where if you buy $40 in select products, you can get vouchers for two free movie tickets. So Greg hunted around for the "select items" while adding up the total in his head, making sure he got to $40 but not too much over. So basically we now have things that we don't really need but could eventually eat. I.E. And a few other things. Greg was pretty sure he'd gotten $40 worth, but the cashier couldn't tell him until she had processed the purchase. As it turns out, he was a bit short! She didn't want to return all our stuff besides the 2 things we did need, so she told him to talk to the manager. It must have been one of those days for the manager, because he didn't want to deal with it and just gave Greg the movie vouchers. So basically, we got 2 $20 movie tickets and some random stuff to eat. We probably didn't come out on top but at least we tried. I say we should take some of this stuff back but that wouldn't be very honest. Besides, taking stuff back to the grocery store is weird and sometimes embarrassing. One time I took back sugar and the lady gave me a strange look... but that's another story for another day. Also, we had tuna melts for lunch. LOL! As long as it's stuff you will eat some day, you did fine. ;) But I agree, Vons without coupons and deals is ridiculously overpriced.